Need an escape? Create your own personal escape with Backyard X-Scapes, online at BackyardXscapes.com. Whatever you're looking for to make your backyard more like paradise, you'll find it at Backyard X-Scapes. With a huge selection of bamboo products, water fountains, pottery, and tropical decor, your backyard will be perfect in no time. They also have artificial grass and artificial rocks to keep the upkeep to a minimum. Check out Backyard X-Scapes for your backyard needs. Check out RetailSteal.com for all the best Backyard X-Scapes coupon codes, Backyard X-Scapes discounts, and Backyard X-Scapes promotions. Backyard X-Scapes offers free shipping on most products to the continental US. Returns and exchanges can be made up to 30 days after the receipt of your merchandise. See site for full shipping and returns details. Enjoy a 10% discount on your entire order from Backyard X-scapes when you use this coupon code online. Use code on orders of $100+ to save. Spend $500 or more at Backyard X-scapes and use this coupon code to save $100. Spend $300 or more at Backyard X-scapes and use this coupon code to save $50. Click to save. Enjoy free shipping on most products from BackyardXscapes.com. Click link to start shopping. 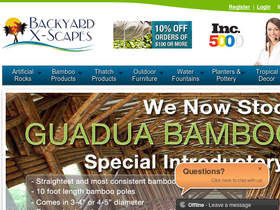 Spend $300 or more on bamboo and tikis and use this coupon code to get $50 off on Backyard X-scapes. Spend $150 or more on Bamboo and Tikis and use this coupon code on Backyard X-scapes to save $20. Click to save. Save $10 on orders of $100 or more from Backyard X-scapes when you use this coupon code. Click to save. Save over 30% on bamboo fencing when you buy at Backyard X-Scapes. Click link to shop. At Backyard X-Scapes, take up to 28% off outdoor furniture. Click link to purchase. Save up to 40% on water fountains at Backyard X-Scapes. Click link to buy. Enjoy a $10 discount on bamboo and tikis from BackyardXScapes.com with this promo code! Offer valid on orders of $100 or more. Enjoy $30 savings on bamboo and tikis from BackyardXScapes.com with this promo code! Offer applies to orders of $200 or more. Use this promo code at Backyard X-Scapes and save 20% off all orders.